With Singapore being summer all year round, it’s no wonder the weather is ever-sizzling and steamy. 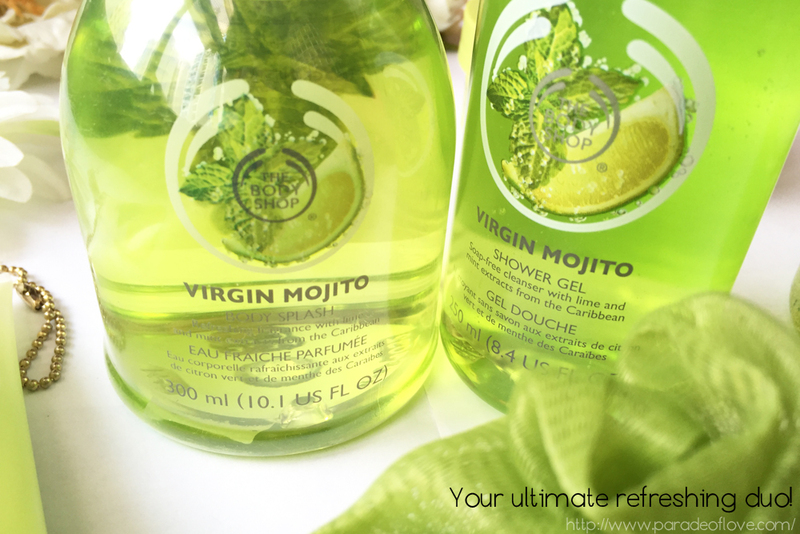 To help you savour summer with the invigorating taste of the Caribbean, The Body Shop has raised the ‘bar’ by bringing you the most refreshing cocktail… for your skin – the NEW Limited Edition Virgin Mojito Body Care Range! The Body Shop has done a great job with this smashing summer scent because it totally smells like the real deal! Think crisp, fresh mint blended with a dash of freshly squeezed lime! 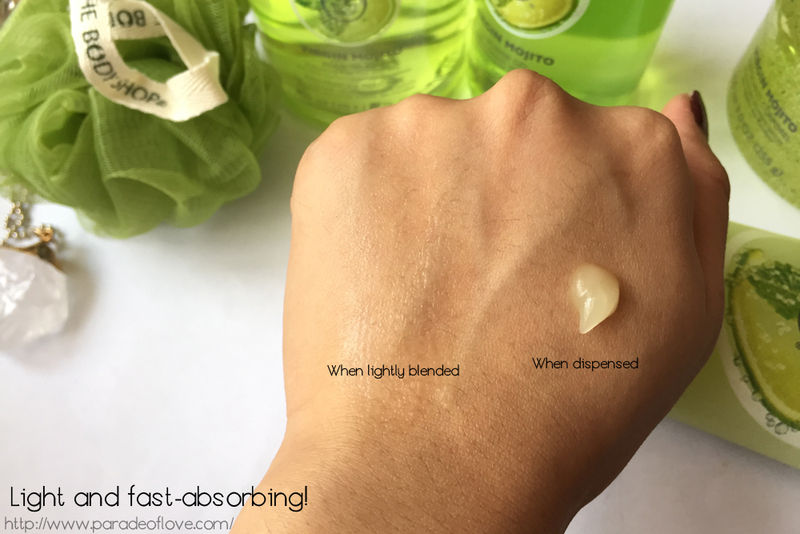 Serving up the starter pair of body cocktails – the Virgin Mojito Shower Gel (S$12.90) and Virgin Mojito Body Splash (S$34.90). Work up a cooling lather with the zesty lime-smelling shower gel before indulging in the body fragrance! The body splash is an innovative new body fragrance in which you apply generously on your body to extend the feeling of ultimate refreshment. This duo is sure to leave you wanting more. 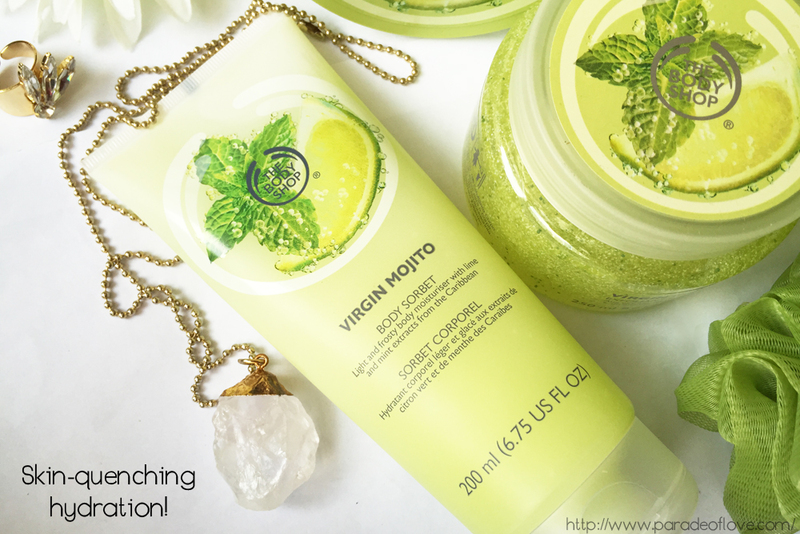 To up a notch of the icy blast of invigoration in your bath, opt for the Virgin Mojito Body Scrub (S$36.90). 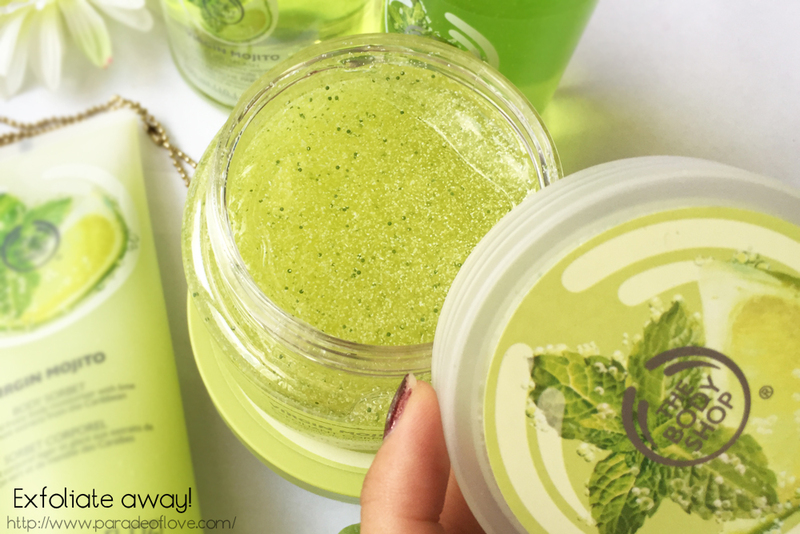 With little beads, this scrub is sure to remove the dead skin cells on your body while drowning you in a zesty lime scent. I personally really like the body scrubs because they leave your skin feeling smooth and balmy. To perfectly compliment the body cocktails, the range serves its sweet treats in the form of a frosty Virgin Mojito Body Sorbet (S$19.90) and its signature Virgin Mojito Body Butter (S$30.90). It’s time to give exposed summer skin a tube of skin-quenching hydration! 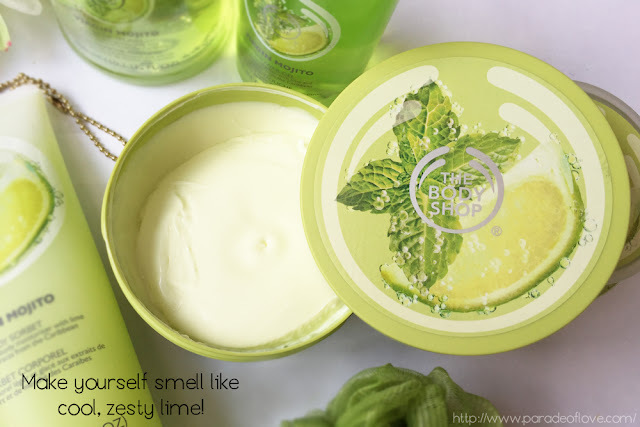 Leave your skin basking in a twist of lime-flavoured glow with the body sorbet! And of course, how can we forget the body butter! Indulge in a hit of up to 24-hour moisture with the all-time favourite, the non-sticky and non-greasy body butter! You can make yourself drenched in a cool spritz of lime while keeping your skin moisturised in the hot summer weather. As I am typing this, I’ve just slipped the travel sized mini into my luggage before I scoot off to Tokyo, Japan! Since we are all prepped and ready, it’s time to hit the bar! This Limited Edition range is by far one of my favourites from the brand because I am sure that it will inject hot summer days with an icy blast of invigoration! 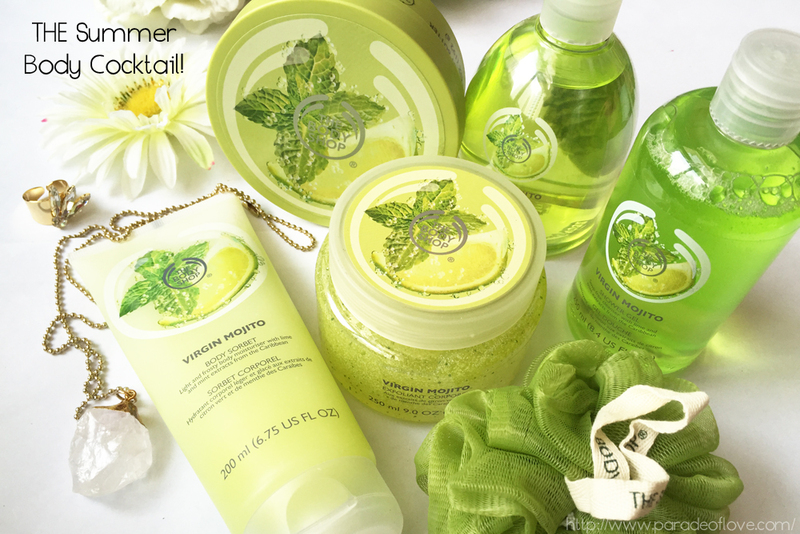 The Virgin Mojito range is available at all The Body Shop Singapore stores! While stocks last! Disclaimer: Products were sent by the team from The Body Shop Singapore for my consideration. The above review is based on my true and honest opinion without influence from others. It also contains information from the brand itself.